When I accepted a position working for the preschool at our church this September, never did I realize how this would change my life. Imagine 18 children between the ages of 3 and 5, gathered around tables in a small room to eat lunch and have "quiet time." Can you hear it? The loud voices, the laughter? The children bring their lunches and boy is that fun. So many containers to open amid calls of "Miss Carol, Miss Carol! Can you open this?" After lunch, the task is to convince the children to lay down on their individual cots for "quiet time." Yeah, right! It's taken a while, but most times we are successful. Since some of the children do not take naps at home, we have started showing a short movie, mostly Veggie Tales. This is a good way to get them to rest for a half-hour (as required by state regulations). By the time they line up to go back to class, I'm a little tired myself. The blessing I have received is in learning each child's individual personality and needs. When I see their beautiful smiles, feel their hugs, and hear them call my name excitedly as they come to lunch, or wave goodbye as they go to class in the afternoon, my heart is filled to overflowing. Today we had a surprise visit from Santa. 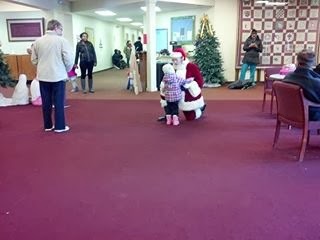 He was in the Narthex waiting for the preschoolers to arrive, as was I, when a little girl saw him and ran up to give him a hug. I just had to snap the picture. God led me to this job when I was lost in grief, not knowing what to do with my empty days after my husband's death. I had prayed for comfort and healing. I've received that and so much more from spending a couple hours a day in the midst of these wonderful children. Thank you for visiting and reading my devotions! You are a blessing to me. I love writing about children. 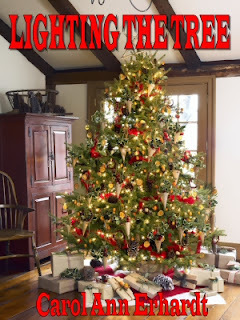 If you love children, you might be interested in reading "Lighting the Tree", a Christmas story about a woman who puts a package under her unlit tree every year, hoping to be reunited with her daughter. Brenda Davis is resigned to climbing into bed and shutting out thoughts of happy family gatherings. Twenty-four years ago she gave her baby up for adoption. Every year since, she’s placed a present under an unlit Christmas tree, waiting until the time they can be reunited. It’s Christmas Eve, and Brenda’s heart is heavy for she’s going to spend it alone—again. But her friend, Dave Kingsdale, has other plans. He convinces Brenda to go to dinner with him. What he doesn’t tell her is that dinner will be at his parents’ home. For a long time, the widower has been longing to tell Brenda he wants more than friendship from her. What he doesn’t know is that she has the same feelings for him. And what neither of them know is a Christmas miracle is about to happen—delivered by an unlikely Santa.